darling wooden apples, Swig gift cards, & yummy treats - all wrapped up and Pioneer Party approved! this cute first aid bag is stuffed with the essentials - chocolate and caffeine! Plus more! We are stocked and ready, stop by! We are throwing it back to 2010 today when we shared with you these darling FREE PRINTABLE ideas! Enjoy!! Our famous Santa is out and jolly as ever! Come in and get first dibs on all your teacher/neighbor/friend gifts for the holiday season, including this darling Santa's Magic Key! Here is the video from our Studio 5 TV appearance today! Thanks so much to KSL for having us on again! 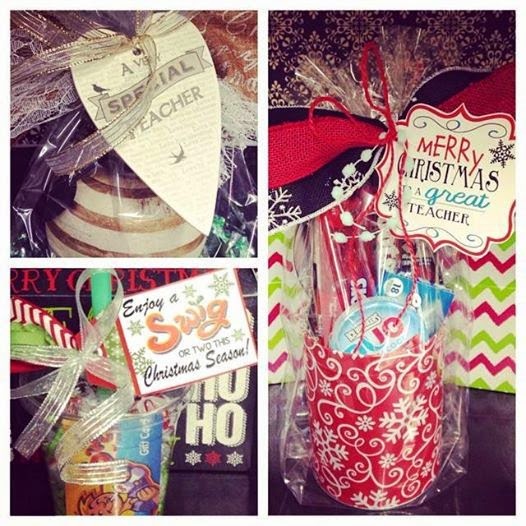 We hope you are inspired and have plenty of ideas to choose from to get your teacher something that will really stand out! If you need even more ideas, check out last years segment on Studio 5 when we also showed some fun Christmas Teacher Gifts! 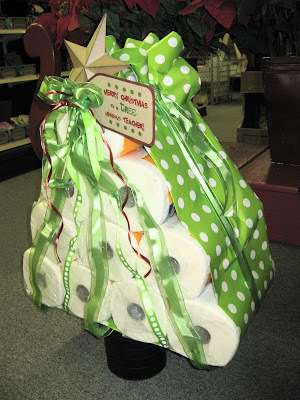 As seen on Studio 5 - another practical gift to give your teacher this year. Grab some glue sticks - the more the merrier! Line them up and straighten so all the words are facing the same way. Use clear packing tape (not the dollar store brand!) and carefully tape them all together. Use two long pieces of tape - one for each side, overlapping them a bit on the top and bottom. 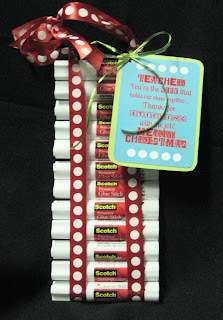 Once you know the glue sticks are definitely stuck together, add your ribbon! We added two strips, tied them at the top, and then again so we can hang it on the teacher's doorknob at school. Add your tag and you're done! Cute and practical! Right click on the tag, copy and paste it into a word document. You can then resize and print from there. We can also print them in our store if you would like! And... head over to Facebook, "like" our page, and then COME INTO our store and receive 15% off your teacher Christmas gifts! Online purchases can use the code "MERRY"